If you are Windows Phone curious or you are looking for a no-contract prepaid phone on the T-Mobile network, the Nokia Lumia 530 phone, locked to T-Mobile but without a contract requirement, is currently on clearance, in new condition for $20 at the Best Buy website. Free shipping with a $35+ order. One way to reach that is to get two of these. They have basic specs, but hey, it’s just $20. You get a Snapdragon 200 processor, microSD slot that can take up to 128GB (fill it up with music and audiobooks and podcasts! ), and runs Windows Phone 8.1. IF you are looking for the AT&T GoPhone version of the Nokia Lumia 635 Windows Phone, you nay get lucky and find it on clearance at a local Walgreens store for $30. This is a big YMMV since there’s no way to check inventory online and they don’t sell this on their website. Regardless though, you can still get it at a nice price online, it is on sale for $40 with a limit of three per customer at Amazon.com. This is locked to AT&T but it is a no-contract prepaid (GoPhone) phone. You can just use it as a Wifi-only device. You don’t have to jump through hoops to do this like Verizon. This already improves upon the previous Lumia 520 which was not a bad introductory Windows Phone. If nothing else, you can get this to explore Windows Phone or use it as a general purpose device around the home (remote control, music or audiobook or podcast player, etc). It averages a very solid 4.4 out of 5 based on 1500+ customer reviews over there. Main specs are a 854 by 480 IPS display of 4.5-inch diagonal, 512MB RAM, 8GB on-board, microSD slot, quad-core processor. 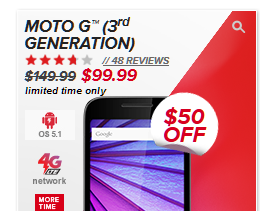 UPDATE (6/4/15): this is now also going for $40 in new condition for Virgin Mobile at Amazon by Amazon actual with a limit of three per customer. There it averages a 4.3 out of 5 based on 142 customer reviews. If you want to try out Windows Phone 8.1 without breaking the bank or getting hogtied in a contract, Virgin Mobile has a great deal for you, for a limited time they have the new condition Lumia 635 4G LTE phone on sale for $40! That’s new condition and no contract. You can use it with any of the eligible VM USA plans or use it as a Wifi-only device. Either way, you have no contractual commitments. It has very decent for $40, Snapdragon 400, 4.5-inch touchscreen, Gorilla Glass 3, 4G LTE (not the going away WiMax), 1GB RAM, 8GB on-board, microSD support up to a whooping 128GB, and such. If nothing else, you can fill up the microSD card with music, and audiobooks and podcasts and have it as a dedicated audio player. 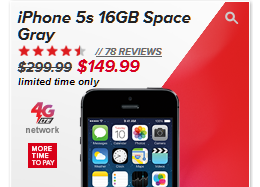 NOTE: this is locked to Virgin Mobile and cannot be used with any other cellular carriers! Looking for a Windows Phone that is not locked to a carrier? And you only want to pay $50 with free shipping? Well, eBay Deals have an offer for that too. It is the manufacturer refurbished Nokia Lumia 521, an unlocked GSM T-Mobile phone, with a limit of 50 per customer. Over 4600 phones got sold so far from this listing, offered by eBay seller “bigdeals” (99.3%). No contract, no carrier lock! If you want to experiment with Windows Phone 8.1 and don’t want to sign a contract or pay a lot of money for a handset, or go the used route, there is a great deal at the moment at Amazon.com. For just $30, you can get the new condition no-contract Nokia Lumia 520 GoPhone (AT&T) with a limit of three per customer. You are not obligated to start a prepaid plan with AT&T. You can just use it as a Wifi-only device.